I knew I was going to love this from the title and the picture. It only got better as I read along. The line that cinched it for me was from Sam himself when he tells Surgary "All books are mysteries till you've finished the last page." Surgary walks into Sam's office because her roommates were robbed. They weren't the only ones and it's up to Sam to piece the puzzle together, especially when Max (the beloved handyman of the complex by cat and human alike) is fired for falling under suspicion of the thefts. It doesn't take Sam long to figure things out (with help from a cast of friends) and put a bold plan of attack in action. It's all in a day's work and a half a pound of lox plus expenses. This is definitely juvenile (meant for ages 9-12) with an adult twist to it. So what? I freely admit I still watch cartoons. Sure, they're cats and they talk to one another, but not to people. They also know how to operate in the human world. I had to suspend disbelief with cats using the computer, telephone, microwave, and can opener. The relationships between the cats were real enough (and no hanky-panky). The plot was simple enough. The story actually made me laugh out loud with its offbeat one-liners. i have to agree - that's one awesome book cover. i wonder how that whole process works. 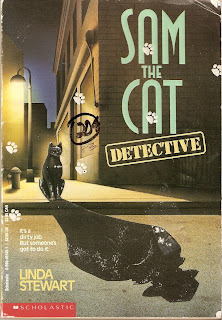 does a publisher go to some artist and say, "hey, i want you to draw a picture showing a cat whose shadow looks like a detective"? or do they simply give the artist a draft of the book and say, "Read this. Then draw something relevant and catchy for the book cover"? Don't I wish I could answer this! I can, kind of, sort of. One of the authors that writes mysteries mentioned the person who does the book covers doesn't read the books, but she sends him the baked goods the book is based on. For instance the Key Lime Pie Murder, she sent him a key lime pie she had baked so he can get an idea of the flavor the book. I think he's just mooching off free sweets, but whatever gets the job done. She's very happy with the artist's work, must he's done all the covers for her books and I think she's on the 11th or 12th or could be higher for the series. I think the give the artist a synopsis or maybe even the author's vision and let the artist work the magic. that could get dicey if he has to illustrate something like "Arsenic & Old Lace".